Want to pump up the flavour of your next shrimp dish? 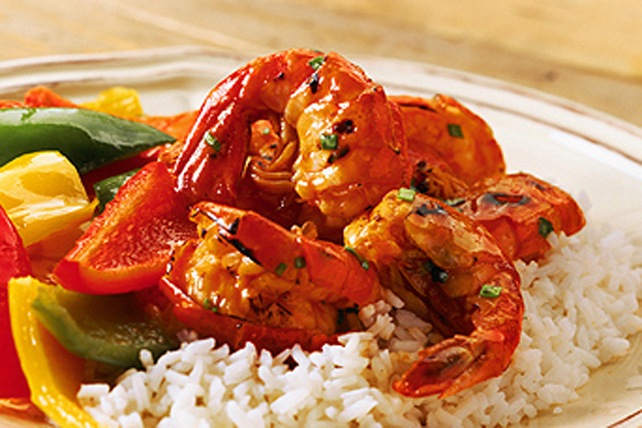 Try jumbo shrimp on the barbecue with a delicious chili sauce. Melt butter in small saucepan on low heat. Stir in chili sauce and orange juice. Bring to boil on medium heat, stirring frequently. Remove from heat. Add rum, mustard, vanilla, garlic, and 1 Tbsp. each chives and cilantro. Cool completely. Heat barbecue to medium-high heat. Cut lengthwise slit in underside of each shrimp, being careful not to cut all the way through shrimp; place in large bowl. Add half the chili sauce mixture; mix lightly. Grill shrimp 3 to 5 min. on each side or until shrimp turn pink. Transfer to plate; brush with remaining chili sauce mixture. Sprinkle with remaining chives and cilantro. Omit rum and increase the chili sauce to 1/2 cup.